I was alerted recently by Rick's mate Dave to a Golden Plover ID article on Birdguides which apparently featured a photo I had sent in. The article can be found here and is a good read, should you be someone who studies wader flocks in autumn, and for your convenience the photo is here. I'm not sure if I have published it before - it is highly possible. It is rather a nice photo if I don't say so myself. Little did I know that the pose could be used to usefully illustrate such arcane things as tertials and primary projections. 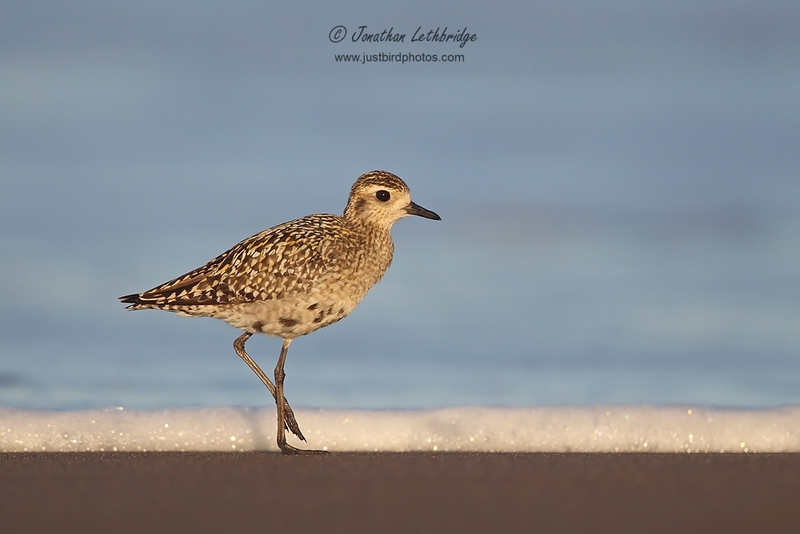 Personally I am of the opinion that the most striking feature for it being a Pacific Golden Plover was the fact I was lying on my tummy on a sandy beach in Hawaii whilst taking it, but I suppose I have to concede that is not necessarily nailed on. I wasn't even considering its identity of course, I was just trying to get a bird in nice light with a nice lack of background. Like I always do.